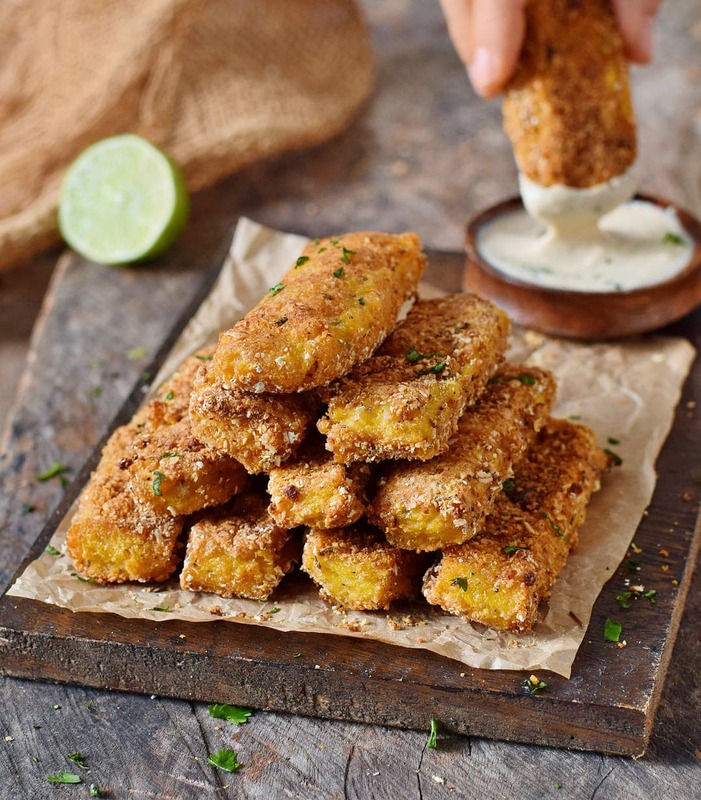 Polenta Fries, the perfect Snack! 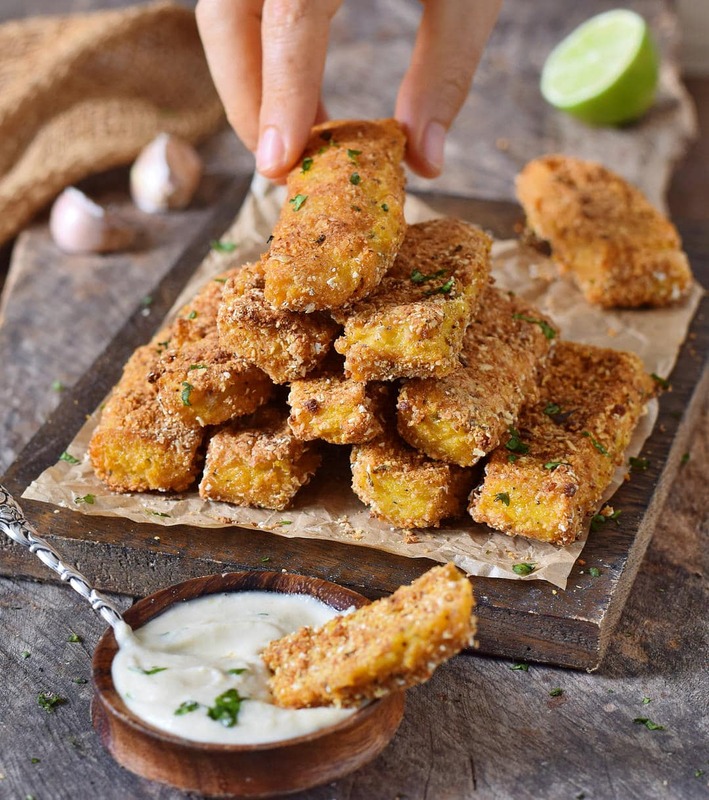 Crispy, hearty polenta fries with a creamy cashew garlic dip! Say what?! Yes, this is the perfect finger food snack which is much healthier than most store-bought chips, for example. This gluten-free, plant-based snack is amazing for Netflix evenings or even as a side dish. It’s a very popular dish in Brazil and I really love it! 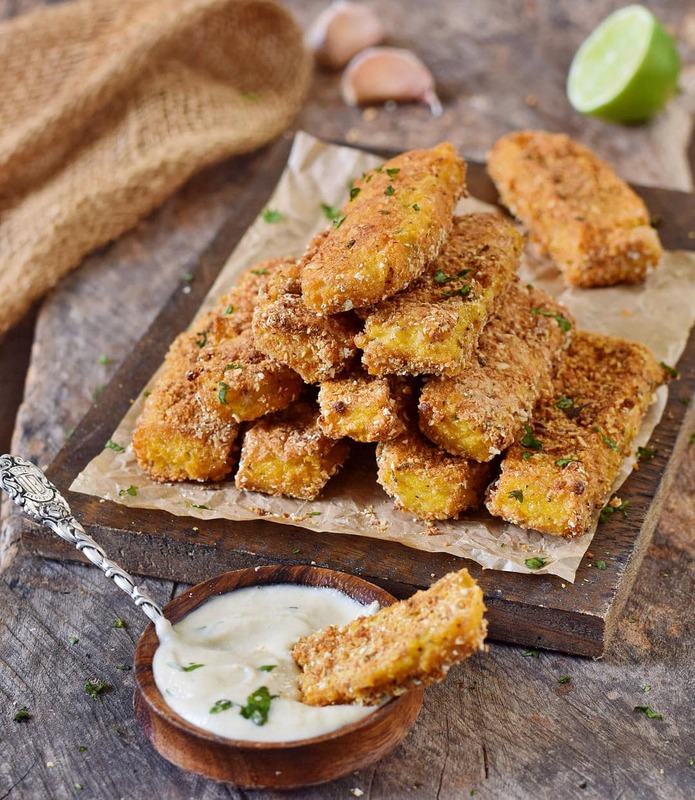 These crispy polenta sticks are super easy to make and you will have a hard time to stop eating them, haha! The recipe is inspired by tasty ! 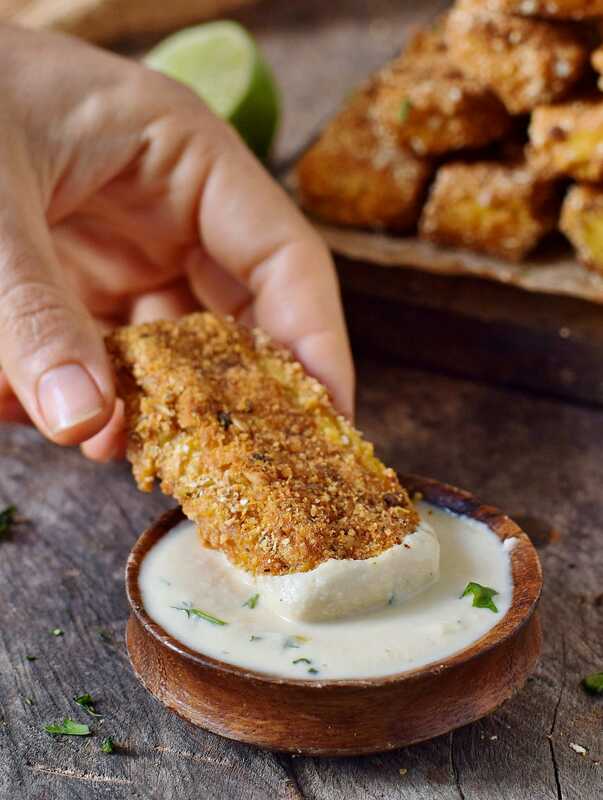 I enjoyed the polenta fries with a creamy cashew garlic dip which tastes heavenly! It’s made with cashews (obviously), garlic, plant-based milk, and a couple of spices. You simply need to soak the cashews for a couple of hours OR you can boil them for 20 minutes until they are soft. Then you’ll just need to process all ingredients in a food processor or blender. I love using my small Ninja Food Processor for all kind of sauces and dips. It works especially great for small quantities and the price was just $30 US. 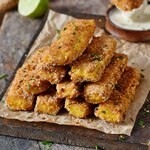 Making these polenta fries is super easy. All you need to do is cooking cornmeal in a pot of vegetable broth (with the addition of some spices and nutritional yeast flakes aka nooch). Then you’ll need to pour the mixture into a baking dish and let it cool for an hour. Meanwhile, you can prepare the breading and the cashew dip but both takes only about 10 minutes. Once the polenta mixture is cold and firm, you’ll need to slice it into sticks/fries. I prefer to brush each slice with a little bit of oil and then coat it with the breading. However, it also works without oil! Then wait until the fries are baked to perfection and that’s it! 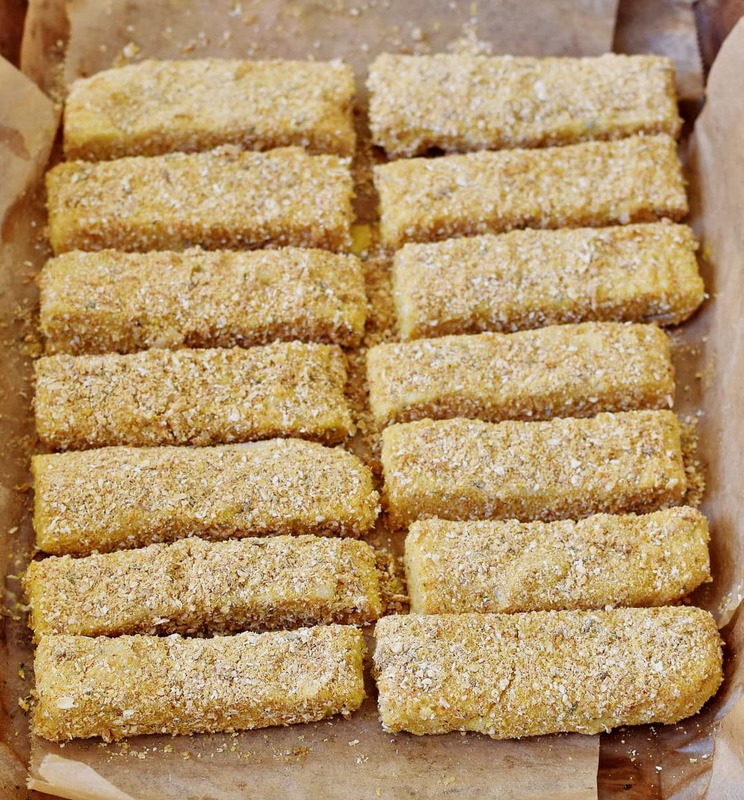 These gluten-free polenta sticks will turn out crispy even when you bake them in the oven. The secret is to brush them with a little bit of oil (you only need a tiny bit) and bake them in the oven until they are golden brown and crispy! If you don’t want to wait 45 minutes until they are crispy and don’t mind deep-fried food, you could also deep fry them in oil. I made my own breading with oat flour (you can use gluten-free oats if you have celiac disease), nutritional yeast flakes, and a couple of spices. You can use Panko breadcrumbs instead of oats. If you make this delicious snack then please leave a comment below and let me know how it turned out! And if you even take a photo of it, then I would love to see it. You can DM it to me on Instagram. Don’t forget to tag me in your Insta caption + photo with @elavegan and use the hashtag #elavegan and I will gladly check out your post. If you love hearty snacks, definitely also check out my spicy Buffalo Chickpea Taquitos! 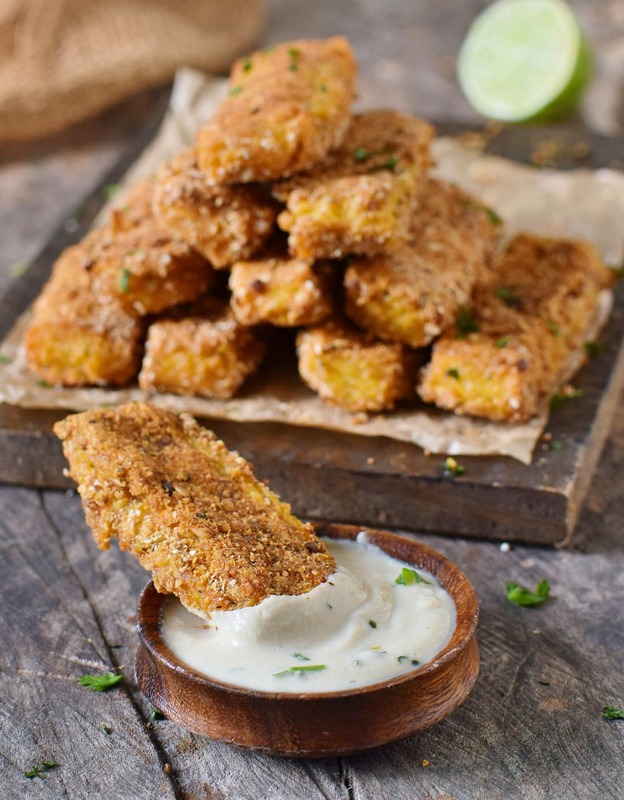 These crispy polenta fries are super delicious and they are the perfect finger food. This healthy snack is gluten-free, easy to make and plant-based. 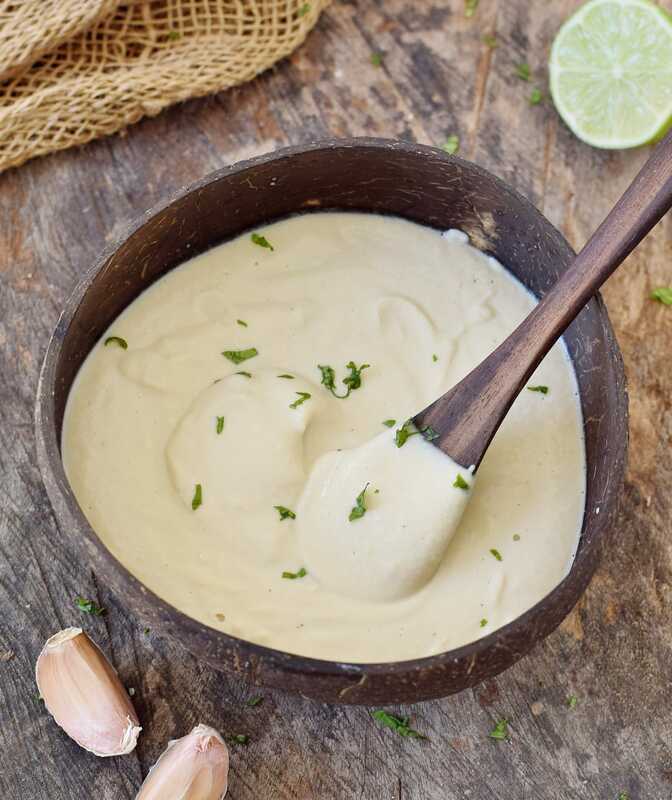 Enjoy with a creamy cashew garlic dip. Pour vegetable broth into a pot, add all spices, sea salt, and pepper and bring to a boil. Slowly add the cornmeal and whisk constantly to prevent lumps. Cook for about 5 minutes on low heat, then turn off the heat. 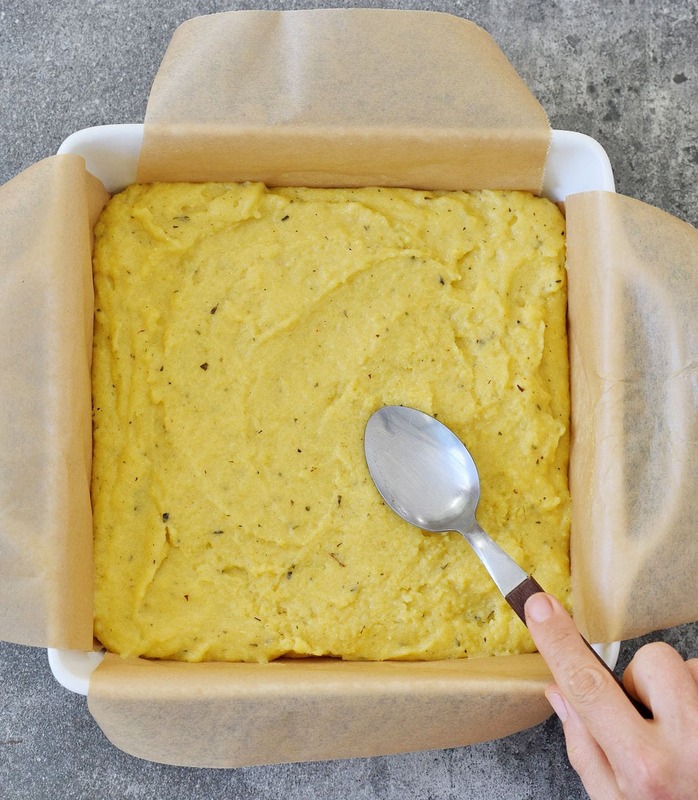 Pour the polenta into a baking dish, lined with parchment paper. I used a 9-inch square pan. Put the pan into the fridge for about 1 hour to set. For the breading, simply put all ingredients into a small bowl and mix with a spoon. 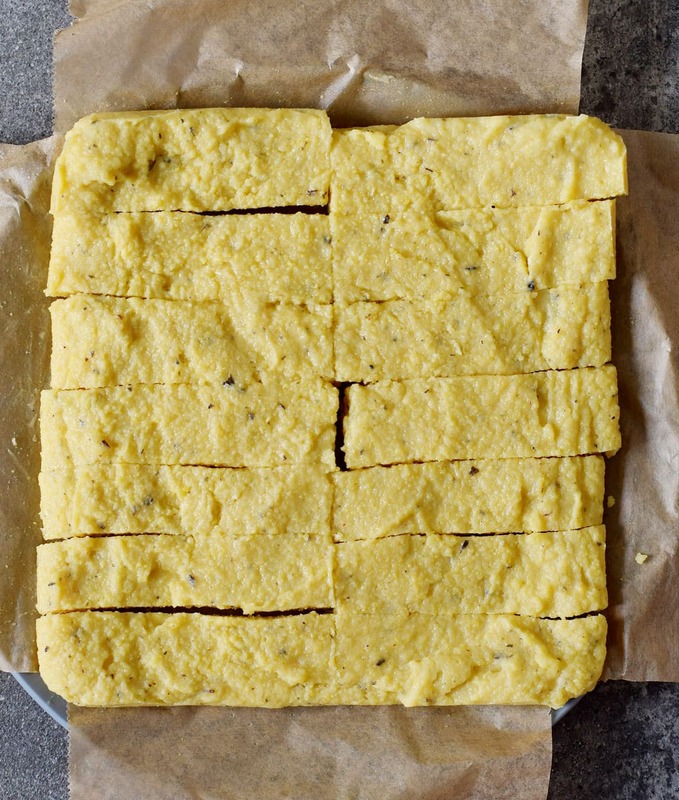 Remove the cold polenta from the pan and cut it into equally sized slices. Scroll up to see the step by step pictures. Preheat oven to 425 degrees F (220 degrees C). 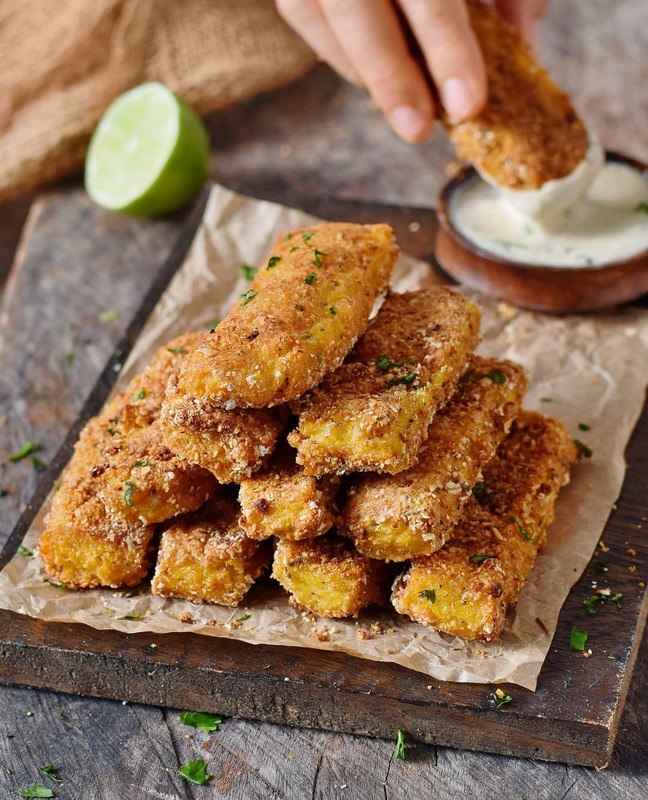 Brush the polenta slices with a little bit vegetable oil and coat with the breading mixture. Bake in the oven for about 40-45 minutes or until golden brown. Flip after 25 minutes. Enjoy with a dip of choice. Check the recipe notes for my garlic cashew dip recipe. To make the Cashew dip, simply process all ingredients in a food processor or blender until smooth and creamy. Oh my my my! It is raining but I am running out to the store to get my missing ingredients!!!! I can taste them now!!!!!!!???? Love your recipes. I no longer can use nutrionional yeast due to causes candida issues.. can I leave this out of your recipe? Nutrtional yeast is deactivated and a different species. It does not contribute to candida. Definitely need to try to make these they look amazing!! This was so good! I had pre-cooked polenta, so I just used the breading and I love it. I’ll be making this often. Mmmmmm they look so delicious ???? Do you think I could use the same process with grits? I have white grits and not polenta but they’re basically the same thing…right? Thanks! Omg these look so crisp and delicious! Will make it for the upcoming superbowl dinner ????????????❤️???? Yes, I will make them as well for the Superbowl! Hi Ela, I’ve tried out this recipe, and I’m really happy with the outcome. Many thanks for sharing it. I do have a couple of questions, though. My fries turned out a bit gooey on the inside. Is that the texture I should be going for? Also, how thick should the polenta batter be before I pour it into a baking dish? Should it be runny or thick? Gotcha! Thank you heaps for the tips. Why do we need nutritional yeast flakes? What is the difference between nutritional yeast flakes and active dry yeast?